Employers who do not pay workers the national minimum wage and the National Living Wage will face tougher penalties under plans outlined by the government. These include doubling penalties for non-payment and disqualifying employers from being a company director for up to 15 years. Employment Minister Nick Boles told the BBC the government was "very keen to step up enforcement". The National Living Wage of £7.20 an hour comes into force in April 2016. It will only apply to workers over the age of 25. 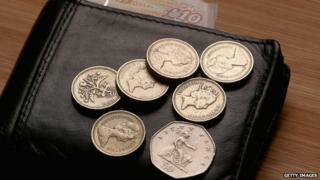 The national minimum wage is currently £6.50 an hour, which will rise to £6.70 next month. The tougher penalties for non-payment will be introduced alongside the government's National Living Wage in April next year. Writing in the Times newspaper, Prime Minister David Cameron said: "The National Living Wage will only work if it is properly enforced. "Businesses are responsible for making that happen." The government also announced plans to double the enforcement budget for non-payment and to set up a new team in HMRC to pursue criminal prosecutions for employers who deliberately do not pay workers the wage they are due. Penalties for non-payment will be doubled, from 100% of arrears owed to 200%, although these will be halved if paid within 14 days. The maximum penalty will remain £20,000 per worker. Mr Boles said the emphasis would be on ensuring workers are paid what they are owed. "Most employers make a mistake and our priority is to make sure arrears are paid. Prosecutions will probably go up but they will remain a rare tool," he told BBC Radio 4's Today programme. Last week, former Sainsbury's chief executive Justin King argued that the government's National Living Wage would "destroy jobs", saying that employers would seek to make their workforce more productive, which would lead to fewer jobs. Mr Boles rejected these claims, saying that higher wages would lead to greater spending, which would ultimately lead to the creation of more jobs in the wider economy.